シャワーヘッド交換方法 | Tanaka Metal Factory CO., LTD.
How to Replace the Shower head. The following method explains how to replace your existing shower head. ※Some makers need to use the adapter included. Firstly check the manufacturer of the existing shower head. 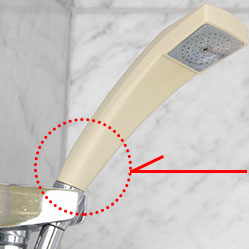 The name should be on the shower head as shown in the red circle in the photo. (Some manufacturers don’t print their name). 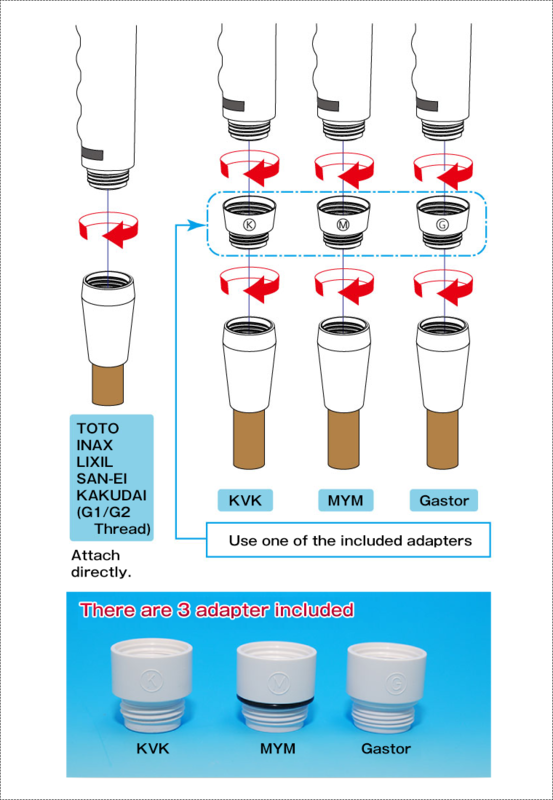 If the manufacturer is KVK, MYM, or Gaster you will need to use the adapter included. The incorrect shower head thread may be a cause of water leaking. Removing the existing shower head. There may be calcium buildup making it difficult to remove the shower head by hand. In that case wrap a piece of towel around the shower base and turn with your hands. You can also use rubber kitchen gloves to get a good grip on the shower head. If the shower head cannot be removed then you should replace the shower hose as well. TOTO and INAX (G1/2 thread) can also be attached. (INAX needs to use the O-ring included with the shower head) . MVK, KVK, Gasuter require attachment with the adapter included. Mizutani products will require an additional attachment available at a home center. ★See here for information on thread differences. After removing the old shower head, attach the Ariamisto Bollina shower head as below. Use one of the included adapters if the shower head threads do not match. Each adapter has a reference letter stamped on it. Please refer to the above picture. Even though the KVK shower hose may seem to screw on directly, the shower head may leak or fall off over time. If the shower head is attached without using the special adapter, the shower head may suddenly fall off and cause injury. The INAX stop button shower head cannot be removed from the manufacturer’s hose. In this case it is necessary to purchase a new shower hose as well. The KVK shower head may be suitable for a direct attachment depending on the year of manufacture. Please confirm that the shower head can be firmly attached to the shower hose without any gap. contact the maker for further details. Try to attach the shower head directly to the hose. If a direct fit is unsuitable, try any of the 3 included adapters. Slowly increase the water pressure for the suitable attachment to see if there is any water leakage. 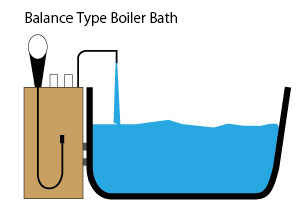 Some balance type boiler units may not be suitable (type installed next to the bathtub in the bathroom, where the boiler and shower are directly connected). ※Osaka Gas, some Rinnai models some Mizutani models etc. In cases where for the balance type boiler or decompression type petroleum heater can be used, there may be a reduction in water pressure. As mentioned above, there are various sizes of screw threads to which the shower head is attached. 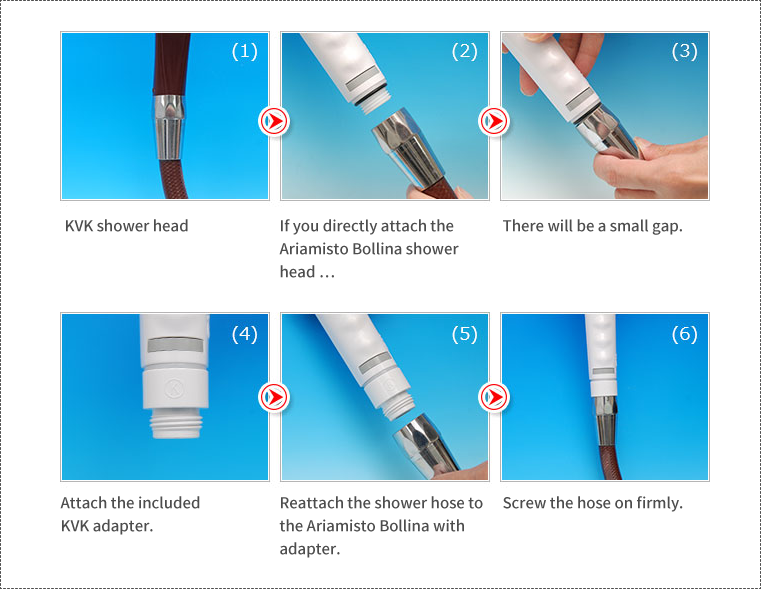 The 3 adapters are used for attaching to the Ariamisto shower head. 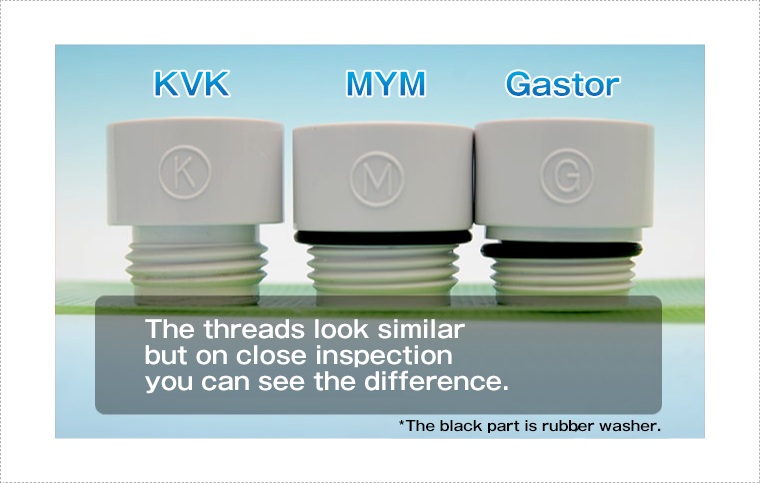 The width of the Gastor thread is thin, while the KVK and MYM look similar, the width of the groove is different. Please take care choosing the correct adapter.